ABU DHABI: The UAE has joined forces with Al Azhar and the Vatican to build harmony, spread prosperity and tolerance and show a united front against all forms of intolerance, leading Muslim scholars have said. 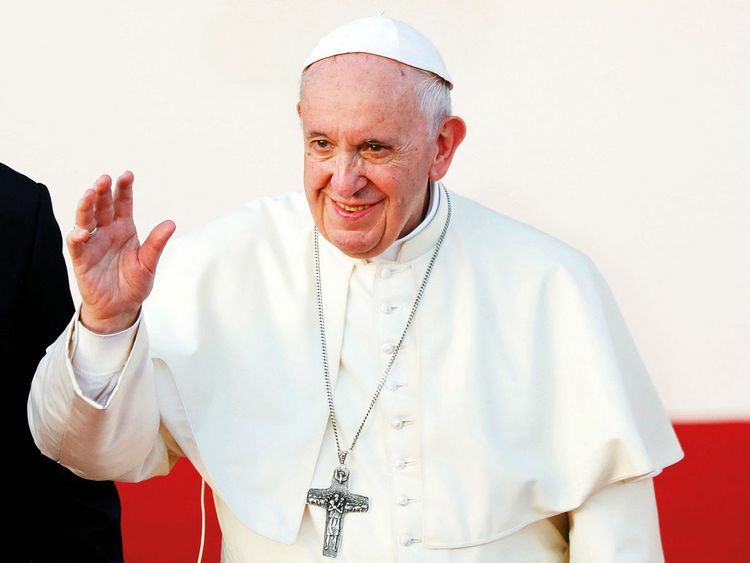 Pope Francis’ historic visit to the UAE, the first to the Gulf region, comes at a time when constructive dialogue between people of all faiths is of paramount importance, the scholars said. Islam’s ties with religions that preceded it are not political or social; rather, they are ties of brotherhood, for Islam is a sister to the religions of Noah, Abraham, Moses and Jesus. The conference highlights that all leaders, public figures and those who head religious congregations, communities and churches have a key role to spread the light of peace and the message of tolerance. The UAE’s opposition to extremist groups that exemplify intolerance spans more than two decades, The nation’s belief in a future defined by human advancement characterises its approach to development assistance around the world, but is best expressed in the society it has created within the UAE which is home to people of diverse nationalities and ethnicities. Dr Ahmad Al Kubaisi, a leading Muslim scholar, said since its foundation, the UAE, its Rulers, its government and its people have always acted in the best interests of all on the international stage. It [the UAE] is a young nation, but one that has matured. It is based on tolerance and cherished peaceful co-existence and has helped others nurture these fundamental values. “The UAE serves as a role model for co-existence among different cultures that are represented by the millions who live in the country. It is a young nation, but one that has matured. It is based on tolerance and cherished peaceful co-existence and has helped others nurture these fundamental values,” Al Kubaisi said. Al Kubaisi said the harvest of progress is brought to fruition through co-operation and co-existence, tolerance and support — all pursued in harmony with partners on the international arena. Shaikh Abdullah Bin Bayyah, chairman of the UAE Fatwa Council and president of the Forum for Promoting Peace in Muslim Societies, said the upcoming visit of Pope Francis reflects a significant aspect of the spirit of tolerance embodied by the UAE and its endeavours to establish itself as a leading nation in spreading the values of tolerance and peaceful co-existence and a driver of dialogue between religions. The moves are a new testimony to the culture of tolerance and forgiveness embraced by the UAE, the seeds of which were sown by Shaikh Zayed Bin Sultan Al Nahyan. Bin Bayyah extended appreciation to the UAE’s wise leadership against the backdrop of declaring 2019 as the Year of Tolerance by President His Highness Shaikh Khalifa Bin Zayed Al Nahyan and the upcoming Abu Dhabi Declaration on Human Fraternity. “The moves are yet a new testimony to the culture of tolerance and forgiveness embraced by the UAE, the seeds of which were sown by Shaikh Zayed Bin Sultan Al Nahyan,” added Bin Bayyah. Dr Mohammad Mattar Al Kaabi, chairman of the General Authority of Islamic Affairs and Endowments, said the founding father Shaikh Zayed Bin Sultan Al Nahyan sought to establish tolerance and noble values as a guiding principle for the UAE. “The nation has established great foundations, including religious and social tolerance that was the lifestyle of its founder,” Dr Al Ka’abi said. “The UAE President’s declaration of 2019 as the Year of Tolerance provides a valuable opportunity to promote the true essence of the approach pursued by the country to inculcate the genuine values of brotherhood, mutual respect and cooperation,” he added. Shaikh Salah Al Jowdar, Imam at Al Khair Mosque and member of the board of King Hamad Global Centre for Peaceful Co-existence, said “The visit by Pope Francis to the UAE is a historic event that reinforces relations and dialogue between civilisations. It confirms the significance of human interaction among religions across the world.